The developers of Saints Row game series don’t stop to surprise us, presenting new and exciting add-ons for their latest released instalment of this crazy action-adventure. Thus, today Deep Silver Volition (the project’s developer) has released a new Saints Row IV DLC which is called "Pirate's Booty Pack". This add-on is now available on Steam, and it costs just $1.49. 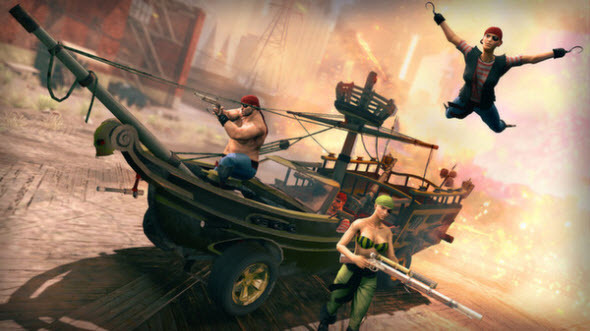 New Saints Row IV DLC, as you have probably already guessed from its title, includes all kinds of pirate attributes: the peg legs, the eye patches, the hooks for hands, the flintlock pistols, and, of course, the most important thing - the pirate costume. Vestured in all these things, you are able to go to "navigate" on asphalt oceans of Steelport almost on the real pirate’s ship. The imagination of the game’s developers, as you can see, is very powerful, because in another dimension, where we fight against the aliens, we also can become the pirates on the very peculiar ship. But in order to help you to imagine, how it looks like, and to decide, whether you should buy this Saints Row IV add-on or not, we offer you to look at a couple of "Pirate's Booty Pack" screenshots and new video about two last released DLCs. Enjoy!